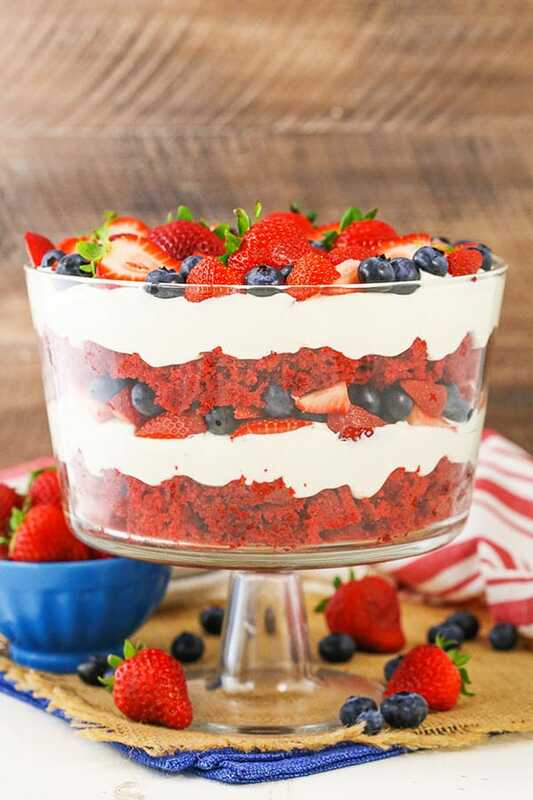 This Red Velvet Berry Trifle recipe is made with layers of moist red velvet cake, fresh berries and homemade cream cheese whipped cream! It’s such a light dessert that’s easy to make and full of flavor! I certainly love a good, easy trifle! Not only do I love the ease of putting them together, they are also quite forgiving and look great with little effort. With the simple red velvet cake used for this trifle and the fresh fruit – we’ve got both easy and beautiful covered. After all, fruit is really nature’s gift to us – it’s so pretty without even trying! So let’s talk a little more about the layers in this trifle. First you’ve got the red velvet cake. I used my lovely Red Velvet Layer Cake. The method for putting the cake batter together is nice and quick. It’s pretty much a mix of all the dry ingredients and wet ingredients separately, then combine them and you’re done! I love the flavor of the buttermilk and the moisture of using vegetable oil instead of butter. It makes such a great cake! Plus, I made it in a 9×13 pan to make it easier! The cake is super moist and has all the great tang that you’ll find in a good red velvet cake. Next up is the cream cheese whipped cream. I’m such a fan of it! Thick and creamy with the light tang of the cream cheese that compliments red velvet so well. 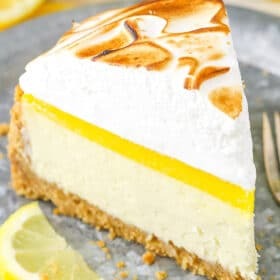 To make it, you’ll add your heavy whipping cream, powdered sugar and vanilla extract to a mixer bowl and whip until soft peaks form. You might be tempted to reduce the powdered sugar, but please don’t. It helps stabilize the whipped cream so that it doesn’t wilt. Once you’ve got soft peaks, add the cream cheese and continue whipping until you’ve got nice, stiff peaks. You want to be sure your cream cheese is nice and soft before adding it. If you keep your house cool, room temperature might not actually make it that soft. So be sure your finger can press into it quite easily to make sure it’s soft enough. 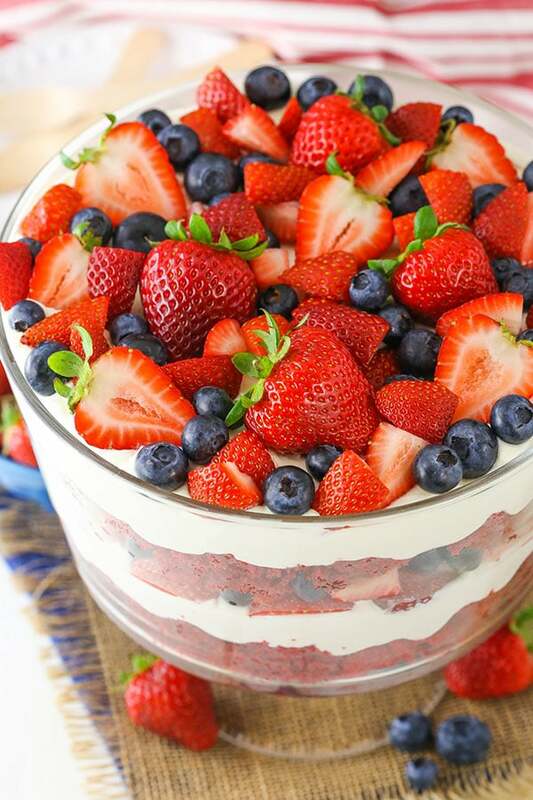 When both the cake and whipped cream are ready, it’s time to layer them together with the fresh berries! The first time I had fresh fruit with red velvet was when I made this Red Velvet Ice Cream Cake. I added blueberries to the top and I instantly fell in love with the combination! They just go together so well! 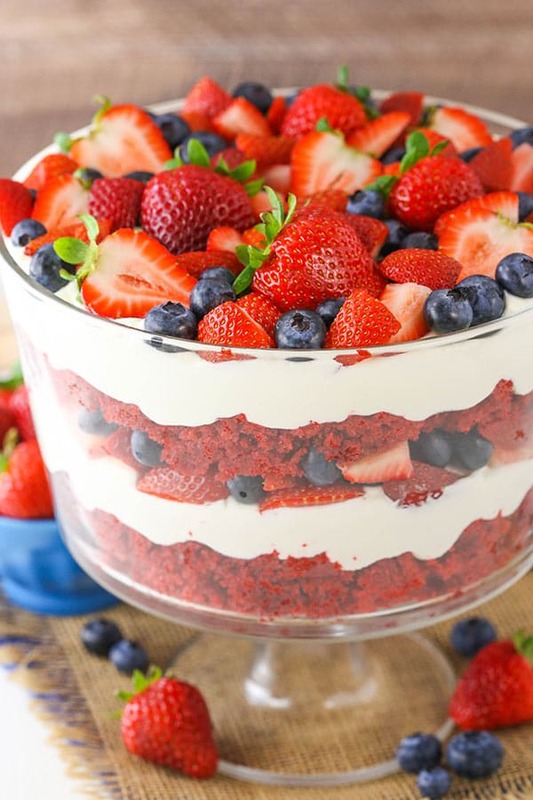 The whole combination in this Red Velvet Berry Trifle is plain awesome! It was definitely a hit! My mom went pretty nutty over it. She loved the flavor of the red velvet and how well it went with the berries. And of course being a big whipped cream fan, it was basically a dream come true dessert for her. I hope it is for you too! 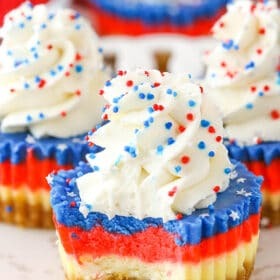 It would certainly be an easy and fun one for the 4th of July with all the red, white and blue in the layers! 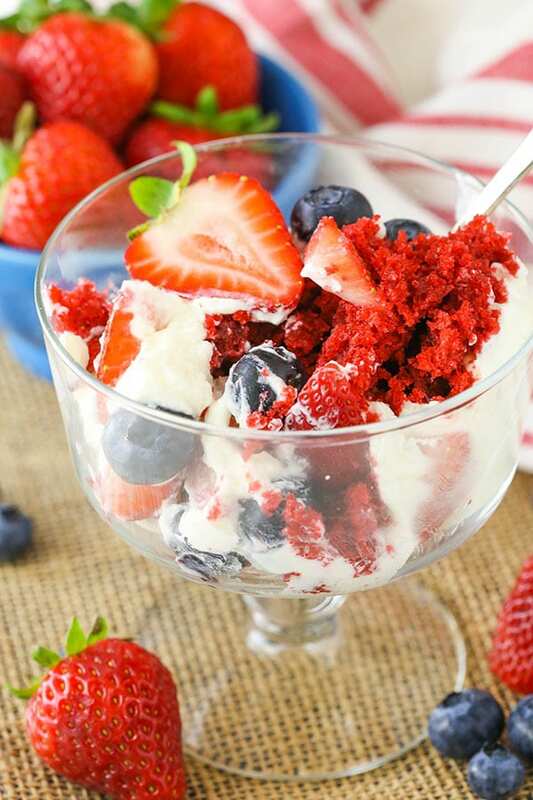 Red Velvet Berry Trifle recipe made with layers of red velvet cake, fresh berries & homemade cream cheese whipped cream! 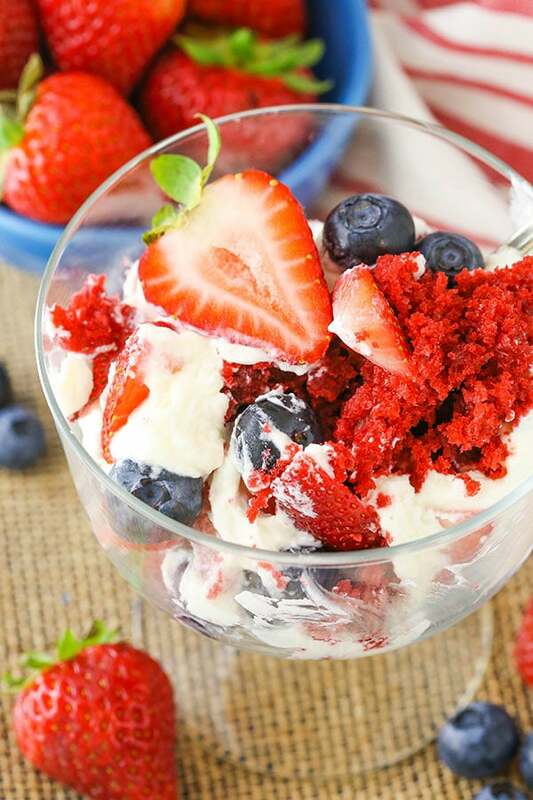 An easy strawberry & blueberry dessert recipe! 1. Preheat oven to 350°F (176°C) and prepare a 9×13 cake pan by spraying the bottom and sides with non-stick spray. 6. Pour the batter into the prepared cake pan and bake for 25 minutes, or until a toothpick comes out with a few moist crumbs. 7. Remove the cake from the oven and allow to cool. 8. When the cake has cooled, make the whipped cream. Add the heavy whipping cream, powdered sugar and vanilla extract to a large mixing bowl and whip on high speed until soft peaks begin to form. 9. Add the cream cheese and continue whipping on high speed until stiff peaks form. 10. To layer the trifle together, first add a full layer of red velvet cake chunks. 11. Top the red velvet cake with about half of the cream cheese whipped cream. 12. Top the whipped cream with a layer of about half of the blueberries and chopped strawberries. 13. Repeat another layer of cake and whipped cream, then finish off the trifle with the remaining berries. 14. Refrigerate trifle until ready to serve. I like to let it all set together for a few hours before serving. Trifle is best when well covered and used within 3-4 days. You probably won’t use all of the red velvet cake for the full sized trifle, but can make a few smaller trifles with it if you’d like. Love doing this with red velvet — it adds such a punch to the presentation! And homemade whipped cream is 100% where it’s at. Thanks for sharing!